Hsin-Ling Liang was born in Taipei, Taiwan. She obtained her B.Sc (2004) and M.Sc (2006, thesis title: Silver particles grown directly on molecular membrane by solution phase process, advised by Prof. Tsang-Lang Lin) degree in Engineering and System Science, College of Nuclear Science at the National Tsing Hua University (NTHU), Taiwan. After graduation, she was employed by Taimaid Technology (Hsinchu, Taiwan) as an R&D engineer. In 2009, she started her doctoral research as a DAAD scholarship holder at Martin-Luther-Universität-Halle Wittenberg in Germany. At present she is a Ph.D. student at Johannes Gutenberg-Universität Mainz, co-advised by Prof. Rudolf Zentel, and Prof. Jan Lagerwall at the Graduate School of Convergence Science and Technology, Seoul National University. She appreciates Prof. Hsin-Lung Chen (Institute of Chemical Engineering, NTHU) who initiated her interests in soft matter science, and Prof. Jan Lagerwall bringing her into the beauty of liquid crystals, which leads her to her doctorate project dealing with liquid crystals in shell morphology produced by microfluidics. Outside research she enjoys and gains very much interesting life experience abroad, about which she ever shared an essay in a Taiwanese newspaper. This photo shows two generations of a buckling texture in the thick part of a liquid crystal shell (4-cyano-4-octylbiphenyl, 8CB) under planar confinement in the smectic A phase. After being cooled from the nematic phase, curved shell surfaces create unfavored smectic layer variation, which is immediately solved by layer undulations, resulting in the first generation of buckling stripes along the surface. The ends of the stripes converge in singularities developed in the thinner part, the opposite side of the shell. The director field is then altered and induces new layer strain, which is relieved by the second generation of stripes within the first generation lunes. 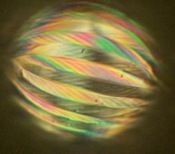 The shell, with a diameter of 200 μm and 3 μm average thickness, was prepared in a coaxial microfluidic device and filled into a flat capillary, which was then placed into a hot stage mounted on a polarizing microscope with a digital camera installed for recording the phase transition phenomena. Jury comment: Thin spherical liquid crystal films, enclosing water and floating in water, produce marvelous textures at the phase transition from the nematic into the smectic phase: A Christmas bubble en miniature.